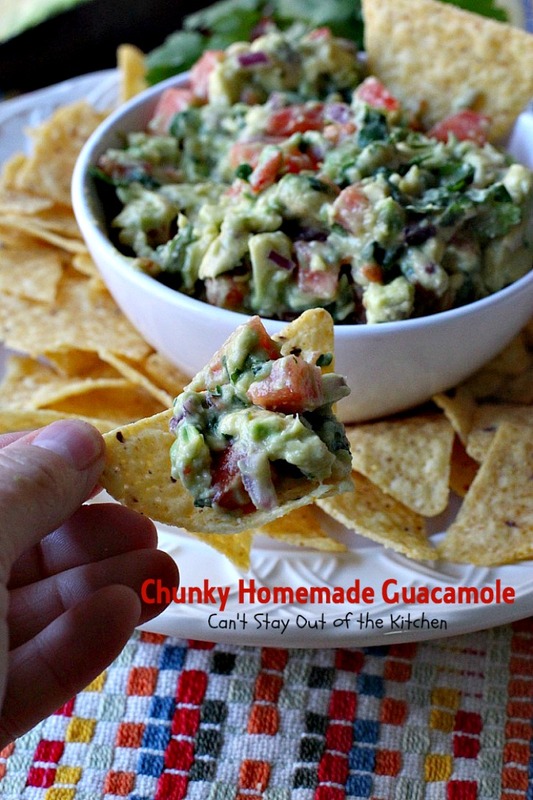 Chunky Homemade Guacamole is the best! No kidding. I love Guacamole! If I’m eating quesadillas, fajitas, nachos, tacos, or any Tex-Mex casserole I want to eat it with Guacamole! I so enjoy eating avocados that I could probably eat one every day! Just plain. But, add my favorite vegetable, tomatoes, and the combination of the two just increases my taste buds dramatically. 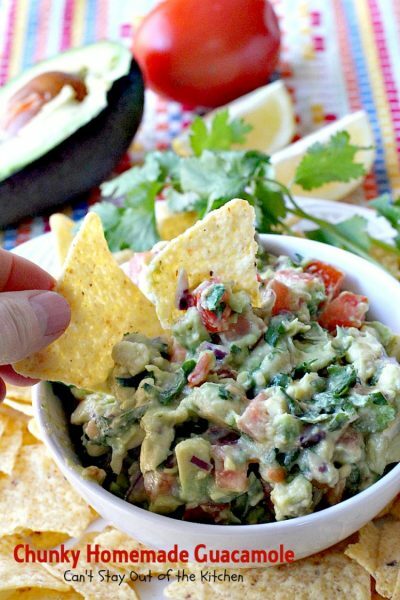 Besides eating with Tex-Mex stuff, Chunky Homemade Guacamole is so healthy and delicious you can serve it like hummus and eat it with vegetables or pita bread as dippers. 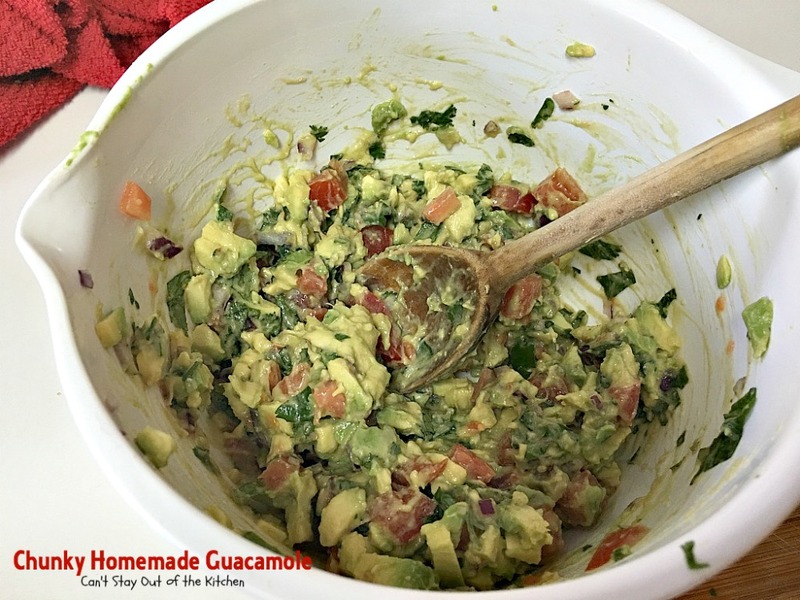 Add to that fact that this Homemade Guacamole is so quick, easy, and economical to prepare — and you can serve this very frequently. Seriously, a batch of this Chunky Homemade Guacamole can be whipped up in 5 minutes! Now that’s quick! 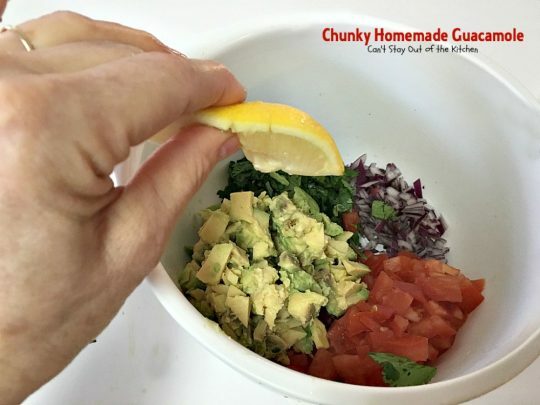 My son, Jordan, put together a batch of this delicious Chunky Homemade Guacamole for us when we were in Pennsylvania last February and I just had to have the recipe. He and Candice served it with Sweet Potato and Black Bean Enchiladas. I also recommend serving as an accompaniment to Taco Lasagna, Taco Bake, Mexican Lasagna, and King Ranch Chicken or even Mexican Bean Taco Salad. The original recipe came from his Vitamix cookbook. While he used a Vitamix blender to process his I didn’t have one at the time so I just mixed mine by hand. I could have pulsed mine with a blender for a few seconds to make it creamier in texture, and I would certainly recommend that if you prefer your Guacamole that way. I chose to simply stir it together and it was still wonderful. Even if you choose to use your blender it won’t add more than a couple of minutes time to this easy recipe. If you’re looking for a delicious, super quick, super easy Chunky Homemade Guacamole recipe than look no farther than this great recipe. When Jordan made it he didn’t cut the pieces of avocado quite as small as mine but he did use his Vitamix blender. It had a wonderful creamy but chunkier texture, which we enjoyed too. When I initially posted this recipe in April 2013, it was before I started using my Canon camera. My pictures were taken with an iPhone and were not particularly pleasing since they weren’t as clear as possible. That’s the reason I’m going back through all my old first year blog recipes and retaking the pictures. I recently remade this recipe (February 2016) for this year’s Super Bowl party and it was incredibly well received. 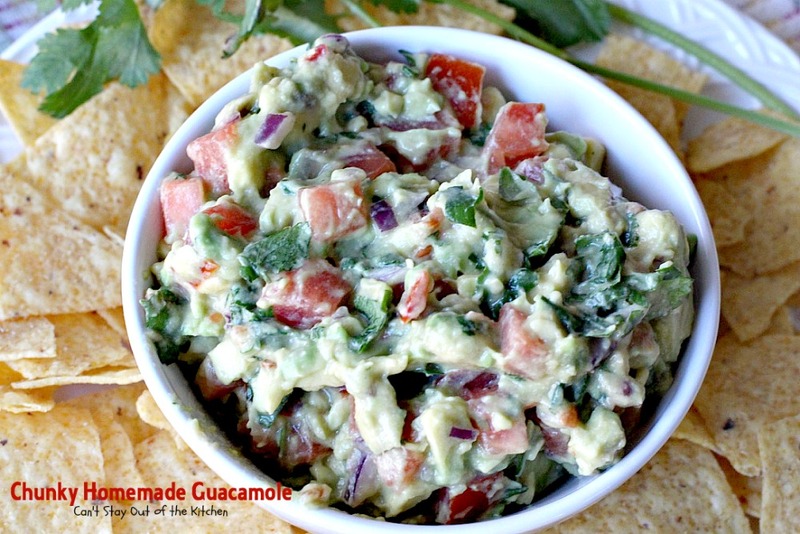 I love Chunky Homemade Guacamole because it is one of the simplest, easiest guacamole recipes I’ve ever made. Plus, it tastes great! Enjoy. 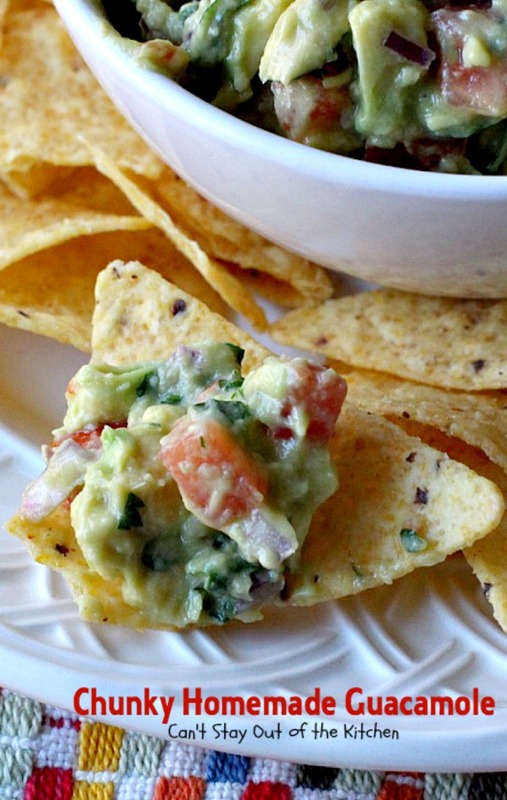 Chunky Homemade Guacamole is delicious served on tortilla chips. 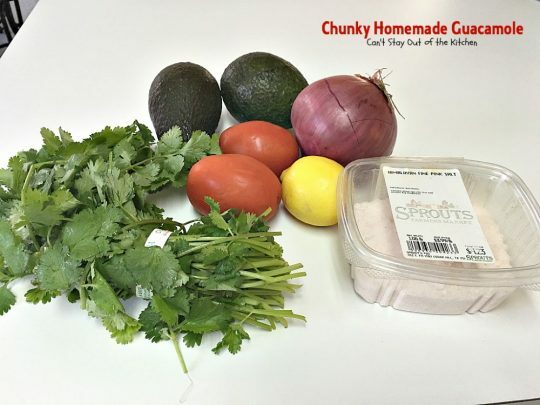 Chunky Homemade Guacamole is so healthy, you can also serve it like hummus with vegetable dippers like sugar snap peas, celery and carrot sticks, on zucchini slices or with pita bread dippers. Slice avocados in half and remove pits. Chop avocado and place in a mixing bowl. If you really want a creamier texture you can also mash half of the avocados with a fork. Add diced tomatoes. I use two Roma tomatoes because Romas aren’t as juicy as regular tomatoes. Add diced red onion, chopped cilantro and salt. Squeeze lemon juice over top of the avocado pieces. Stir all ingredients to combine. If desired, place in blender and pulse for just a few seconds until mixture is still creamy but has plenty of chunky texture left. Chunky Homemade Guacamole is a healthy nutritional alternative to after school snacks for your kids. 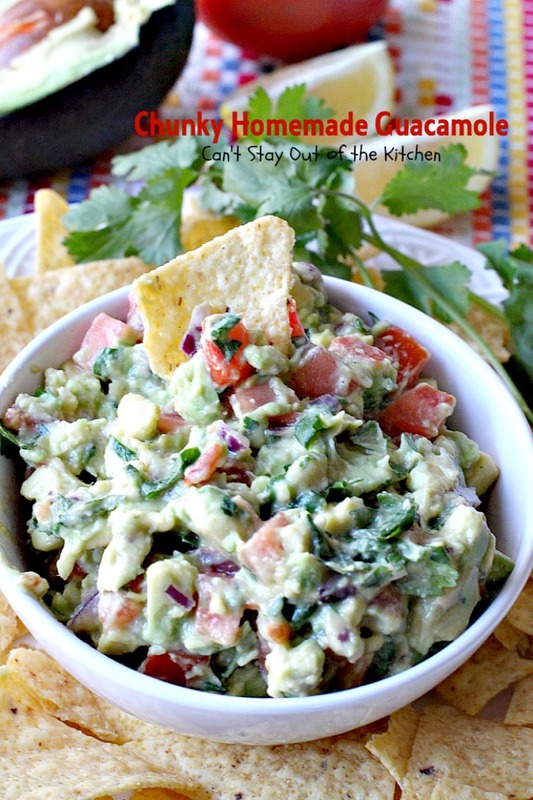 Serve with tortilla chips or eat plain! This recipe is so simple but really incredibly tasty. I think I ate three or four servings of this when Jordan made it for us in Pennsylvania. I ate it with the Sweet Potato and Black Bean Enchiladas, but I also ate it by the spoonful just by itself! Wow, it was yummy. Chunky Homemade Guacamole is a great snack to serve for football games, tailgate parties, or any party where you’re serving finger foods. 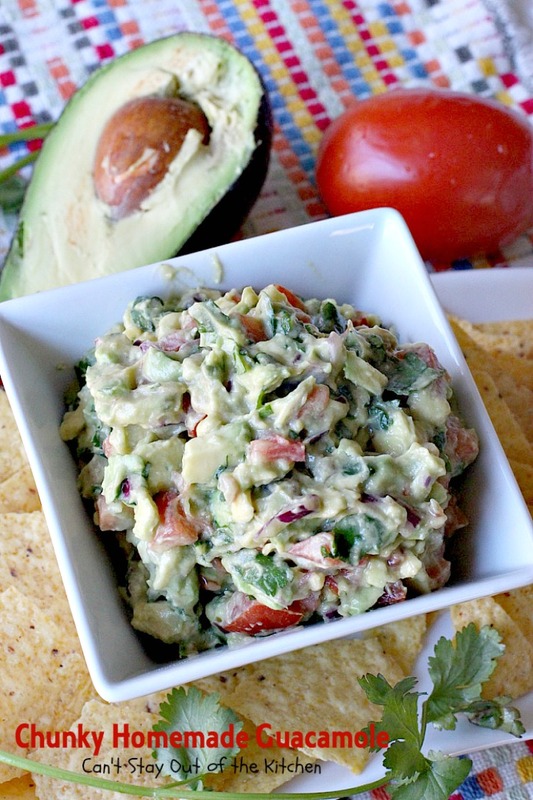 This quick and easy guacamole recipe is one of the best you'll ever eat! It's also gluten free and vegan. Mix all ingredients together and serve, or place in a blender and pulse for a few seconds to have a creamier texture. Don't pulse too long and lose the chunkiness of the avocados and tomatoes, though. Serve with tortilla chips, as a side for Tex-Mex dishes, or with vegetable dippers or pita bread dippers. NOTE: You can also mash part of the avocados with a fork to get a little creamier texture. NOTE: If you use very ripe avocados, the guacamole will be much creamier without mashing or putting in a blender because the avocados will be so soft. Recipe adapted from Vitamix cookbook. 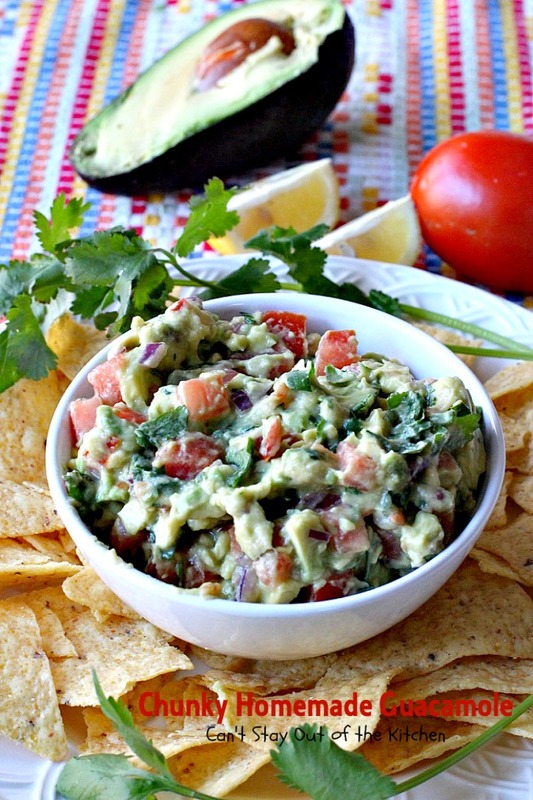 This quick and easy guacamole recipe is one of the best you’ll ever eat! It’s also gluten free and vegan. 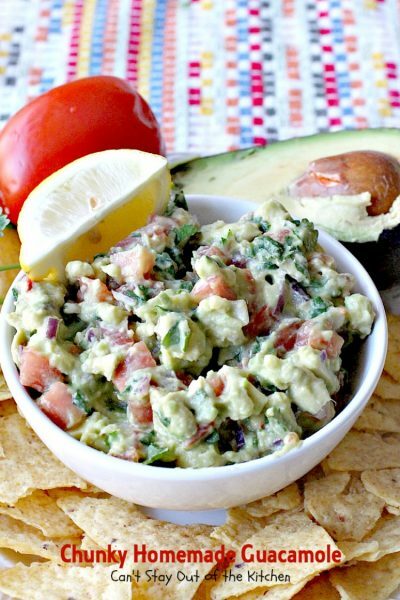 Don’t pulse too long and lose the chunkiness of the avocados and tomatoes, though. You can also mash part of the avocados with a fork to get a little creamier texture. [br][br]If you use very ripe avocados, the guacamole will be much creamier without mashing or putting in a blender because the avocados will be so soft. This close up shows the wonderful texture of this healthy, low calorie appetizer. It tastes amazing! Serve with tortilla chips, or as a healthier snack with vegetable or pita bread dippers. Chunky Homemade Guacamole is both gluten free and vegan. 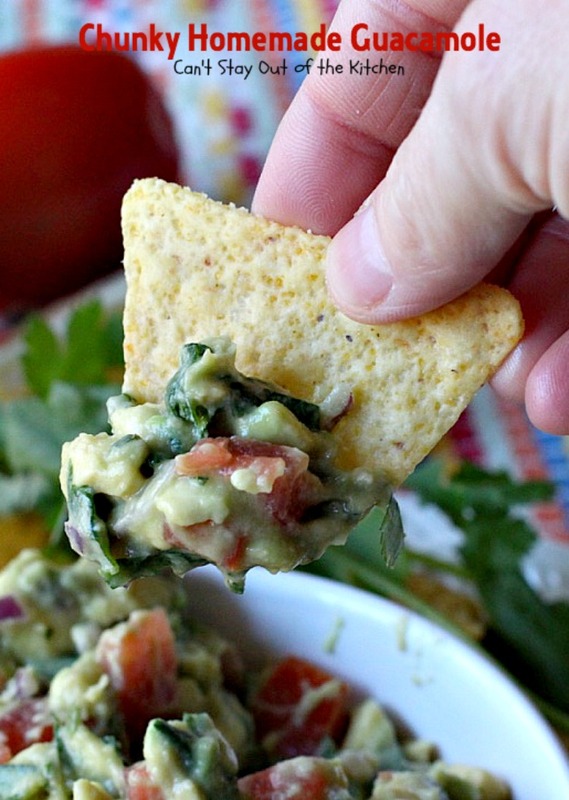 Each bite of Chunky Homemade Guacamole is delectable. 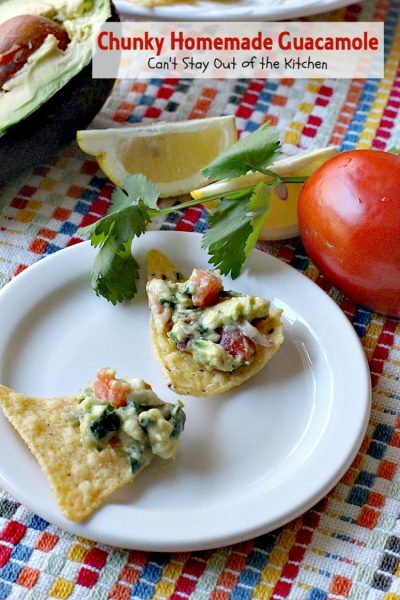 This quick and easy recipe can be made so quickly you can serve it often–and it’s so healthy, too, with all the rich omega 3 oil from the avocados. Try it today! Hi, Nancy. I love it too, and the nice thing is it only takes about 5-10 minutes to make up! Hope you are having a great day. You’re right! Took less than ten minutes. Goes into my quick quick, easy and healthy file. I used lime, and it was great. so glad you liked it, Linda. We love this recipe and make it often. Absolutely fresh! That’s a new trick about using the pits to prevent browning. I’m excited to learn something new. Yes, I love fresh guacamole. I think I could inhale a bowl right now! Love guacamole! I’ve never heard of the avocado pit trick–will have to give it a try. So do I! This recipe is really tasty too. And SOOO easy!